I can’t believe time past so fast! 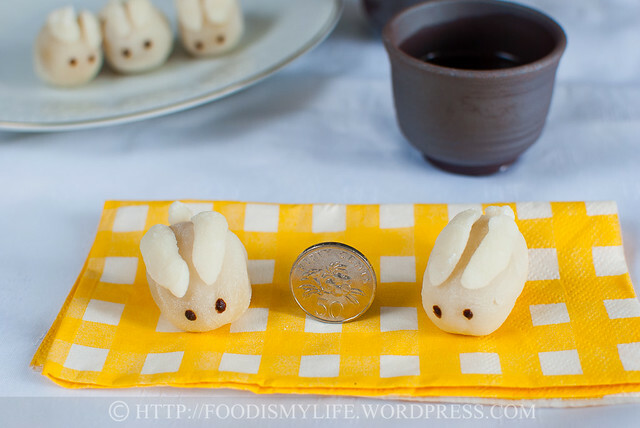 It seems like just only yesterday I’d made these piggy and bunny mooncakes and I’m already making them again! Mid-Autumn Festival is a very popular festival celebrated by Chinese worldwide and is held on the 15th day of the 8th month in the Chinese calendar, when the moon is at its roundest. Somehow I’ve always heard people saying that the moon is always the largest and roundest during Mid-Autumn festival… I wonder how true is that! I got the snowskin recipe from Mei Shi China (Chinese website), which uses raw glutinous rice flour and rice flour steamed together in milk. This recipe is different from other recipes I’ve found online which uses cooked glutinous rice flour mixed with water. The bunnies are only slightly taller than a 50 cents coin! 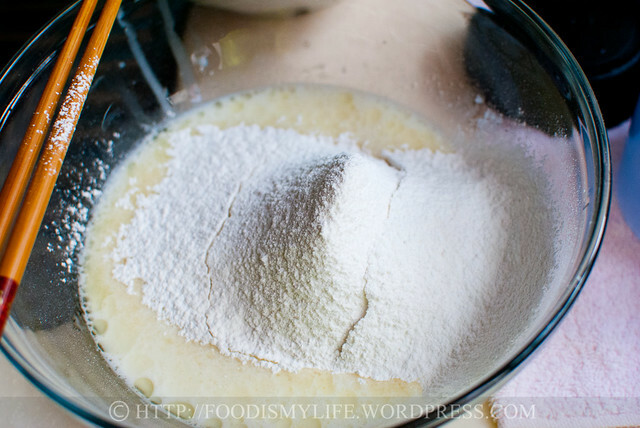 Measure milk, coconut milk, sugar and oil in a mixing bowl. Whisk together with a pair of chopsticks. Sift glutinous rice flour, rice flour and corn flour in. Whisk to get a smooth consistency. Cover and let rest for 30 minutes. Steam over high heat for 15 minutes until the dough has set. Stir with a pair of chopsticks until the dough forms a ball. Let cool completely before using! 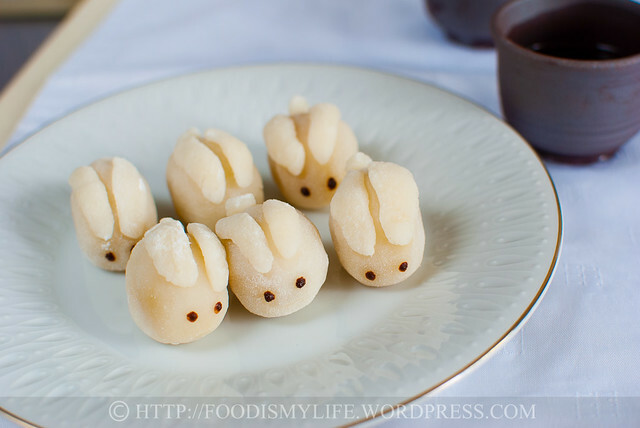 Bunnies waiting to be eaten up! I’m submitting this to Bizzy Bakes’ Recipe Box #15. 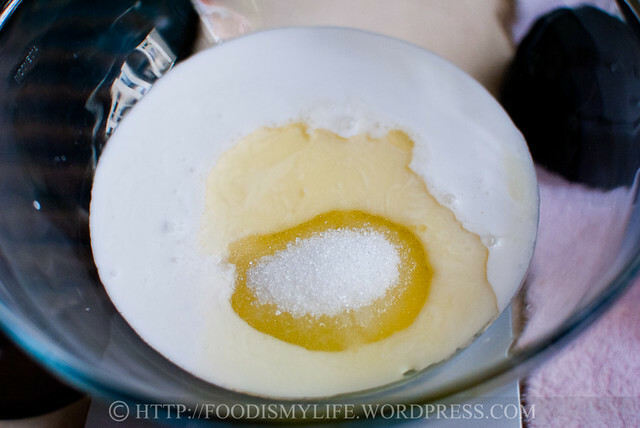 Do hop over to see all the lovely treats foodies have submitted! Measure glutinous rice flour, rice flour and corn flour in a small bowl. Stir to mix them thoroughly. 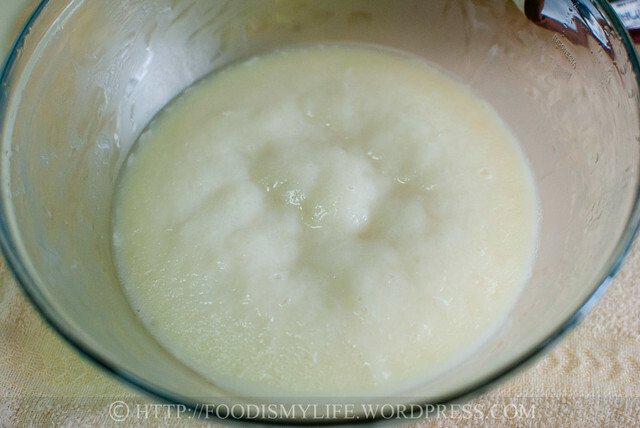 In a large heatproof mixing bowl, measure the caster sugar, coconut milk, full-fat milk and vegetable oil. 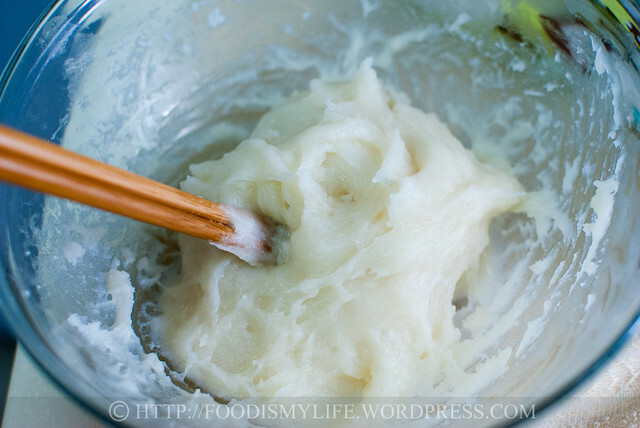 Stir with a pair of chopsticks / whisk to mix them together, dissolving the sugar in the process. 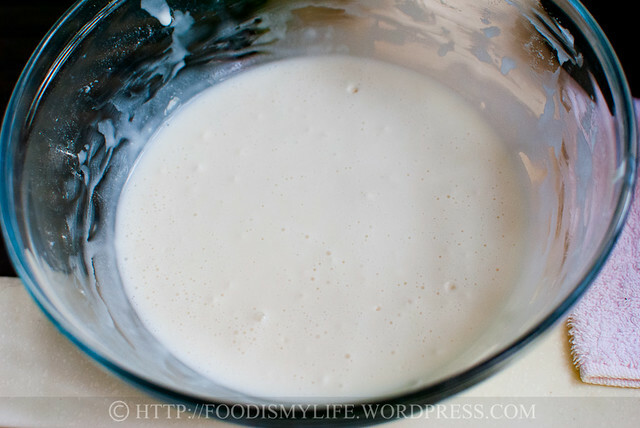 Sift the flour mixture into the milk mixture and whisk till incorporated. Cover the mixing bowl with plastic wrap (cling film) and set aside for 30 minutes. Cover the dough with a plastic wrap (cling film) - making sure the plastic wrap is touching the surface of the dough. This is to prevent the surface of the dough from hardening. Let the dough cool completely to room-temperature before using. If urgent, place it in a room-temperature water bath to cool it faster - you want the dough to be at room temperature, not cold. While the dough is cooling, divide the filling into 25 pieces(10 grams each) and roll desired amount of toasted melon seeds in them. Set aside. Once the dough has cooled completely, dust your hands with cooked glutinous rice flour and divide the dough into 25 pieces - with each piece weighing 8 to 10 grams. The extra dough will be used to make the ears and tails. Dust your hands and wrap a filling inside the dough. Shape into an oval shape. This will be the bunny body. Dust your hands and pinch 3 small doughs from the extra dough. Shape 2 into ears and 1 into tail. Dab the ears and tail in a little water (or brush with a little water) and stick onto the bunny body. Pipe a little melted chocolate for the eyes. Repeat until all bunnies have been formed. Cornflour can be substituted with wheat starch (澄粉). Coconut milk can be substituted with either milk or evaporated milk (炼乳), but it will not be as fragrant. Vegetable oil can be substituted with olive oil (橄榄油). Use any of your favourite filling – red bean, tiramisu, etc. To toast melon seeds: spread an even layer of melon seeds on a baking tray. Bake in a preheated oven of 175 degrees Celsius for 5 – 10 minutes until the seeds are fragrant and lightly golden brown. Let the seeds cool completely to room temperature before using. To prepare cooked glutinous rice flour: spread an even layer of glutinous rice flour on a baking tray. Microwave for 2 minutes on high till the flour is heated through. Alternatively, fry the flour in a non-stick frying pan until heated through. When tasted, the flour should not have any flour taste. Let cool completely before using. The flour helps to prevent the dough from sticking onto your hands. To make a normal size mooncakes (~45 grams) – grab 25 grams of filling and mix in some melon seeds. Wrap in 20 grams of dough and use the mooncake mould to make a mooncake shape/design. this is very different from the usual snowskin recipes using koh fun and the coconut milk i believe it’s a good addition. Yeah, i remember the moon was very bright and round last year, shall see it this year! These are incredible, Jasline! I’m glad you included a coin for perspective and I bet they disappear once served. Who could possibly resist them? this is an awesome recipe. I think I’m gonna try making snowskin mooncakes this year too, so I might give this recipe a try. Plus, bunnies are so cute! Haha thanks Hannah! My friends enjoyed eating them 😉 Have a great day ahead! 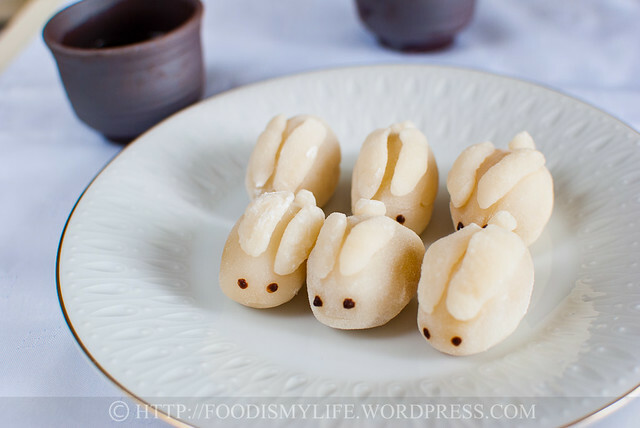 When I first ate them immediately after wrapping, they taste really like mochi, very chewy! Glad you like these mooncakes! These are almost unbearably cute! It seems a shame to eat such art… But they do sound delicious, too. They are so tiny and cute. Everyone must enjoy them. So cute, Jasline! All the kids would love it! 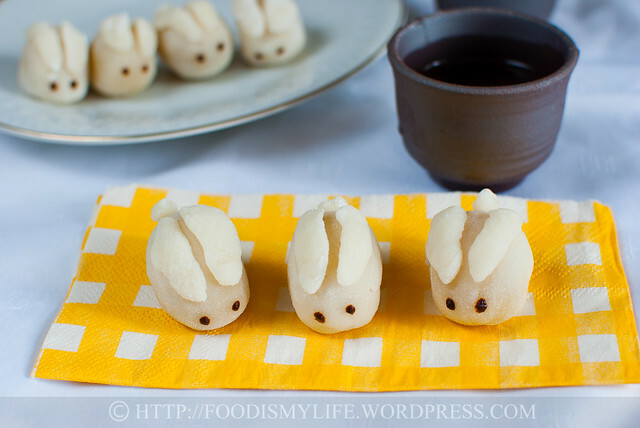 These rabbit mooncakes are so adorable! I haven’t tried making my own mooncakes so it’s great to read about your attempt and your step-by-step photos and detailed guide. Oooh….so cute! Great job, Jasline! These would certainly bring smiles! These are the cutest little things; love them! Ooh, how creative! Love it!